A/N: Look what marvelous reader Lecypooh made for me! 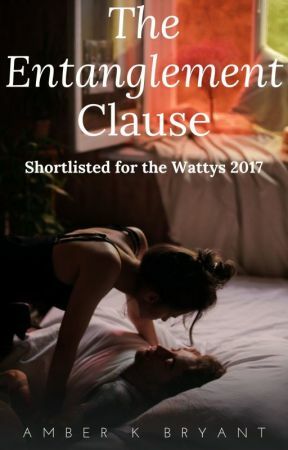 *gasp* In fact, she made 3 different covers for The Entanglement Clause! The other two are at the bottom of the chapter so don&apos;t forget to check them out! "Because you had no choice. Isn&apos;t that right?" By this point he was already across the room, gathering his clothes. His first reaction, other than shock, had been to assume it was his. They&apos;d been together long enough that it was possible. He&apos;d taken in a deep breath. "Wow... this is... unexpected." She didn&apos;t give him enough time to fully process his potential fatherhood. There was no opportunity to let the information sit, to give him the space necessary to decide if this was good news or bad news. Not yours. A swarm of frantic bees buzzed around where his brain should have been. He leaned back against his dresser. "It&apos;s Sam&apos;s then." This should have been a relief. He was off the hook. No whiny little germ-laden baby to tie him to this woman who he... who he refused to care about right now. But instead, that swarm of bees turned angry, as though someone was trying to smoke them out of their hive to steel away their queen. "Sam? No! Oh my God, no. It&apos;s not... There&apos;s never been anything romantic between Sam and me. You have to believe that." "There&apos;s not supposed to be anything romantic between us either, but we still managed all right." "You know what I mean. I&apos;m serious, Ryker. I haven&apos;t slept with anyone besides you since I moved to Moon Beach. I haven&apos;t even thought about it. Besides, when the hell would I have had the time. I&apos;ve seen you almost every day!" Arms crossed, Ryker kicked back against the dresser and began pacing the room. "If that&apos;s true then... Then are you saying you didn&apos;t just find out you&apos;re pregnant? You must be, what... No, I&apos;m not going to guess. How far along are you?" Still covered in his aunt&apos;s quilt, Emmie brought her knees up and rested her chin on them. "Three months." "Three months! So... you&apos;ve known all this time, haven&apos;t you? And you didn&apos;t think it might be a good idea to tell me?"